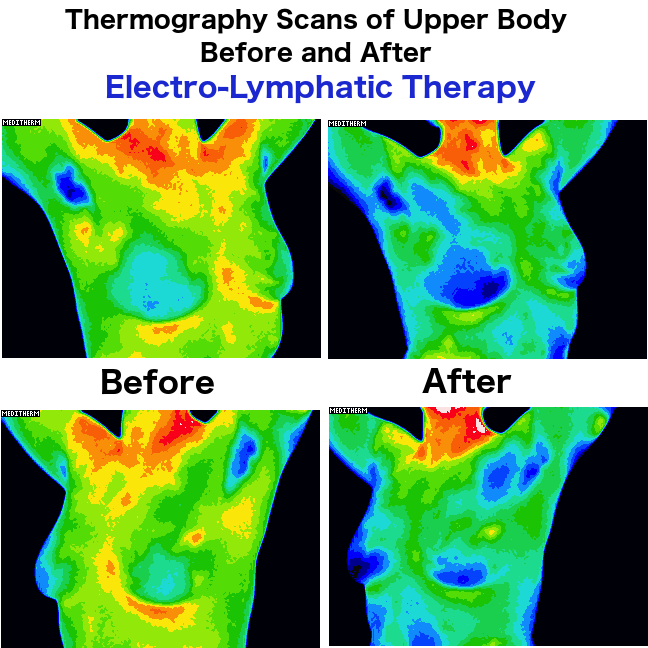 Electro-Lymphatic Therapy (ELT) utilizes state-of-the-art tools to significantly improve lymphatic drainage. It does this by precisely targeting and unclogging coagulated pockets of lymph located in the lymph nodes or in lymphatic pathways throughout the body. Electro-Lymphatic Therapy (ELT), also sometimes calledBio-Electro-Lymphatic Drainage (BELD), is painless and highly effective, especially in complex lymphatic cases. Electro-Lymphatic Therapy (ELT) is a gentle, light touch, non-invasive technique that stimulates lymphatic drainage. It uses a combination of vibration, light, and electrical waves to break up proteins that have become stuck together in lymphatic vessels. Electro-lymphatic therapy machine amplifies the effects of Manual Lymphatic Drainage, reducing the time needed to move fluid manually. It is far more efficient at relieving congestion and edema than manual manipulation, even when it is used by itself. ELT helps to clear the body of toxic residues, helps to better absorb supplements and medications, which may (strictly under the guidance of your prescribing physician) allow you to decrease the dosages needed for efficacy. Clients experience a deep sense of relaxation that lasts a short time after each treatment, followed by an increase in energy levels. Positive effects tend to accumulate with each session. Best results are experienced when receiving therapy on a regular basis. 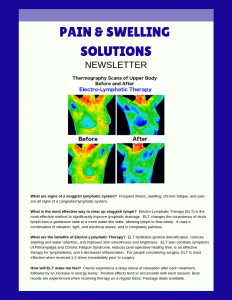 Electro-Lymphatic Therapy works and the benefits of ELT. Q. How should I prepare for ELT? A. The most important thing about getting the most out of your Electro-Lymphatic Session is to be well-hydrated. Begin drinking extra water a day of so before your session and continue drinking water for at least another 24-48 hours after your session for maximum benefits. Q. Should I expect to experience any detox symptoms after the session? A. Most people feel great immediately after their session and continue to feel very energized the next day. It is possible that if you are under-hydrated or if you have a lot of toxins to purge that you might feel a bit fatigued afterwards. Generally this is gone after a day. The answer in both of these cases is to simply drink more water. Your body needs the extra water to pee out the waste. Q. How many treatments are recommended and how often? A. Usually people get this therapy about twice a week for a couple to three weeks to get the maximum benefit. Thereafter they can back down to once a week or once every two weeks to maintain. If budget is an issue and you can only do a couple of treatments, I encourage you to still do one or two treatments. They will make a difference. Package deals are available to help repeat clients save some money. (Look for the “Special Offers” button). A. Most people notice an immediate result followed by even more improvement when they wake up the next day. Many people describe a sensation of increased energy immediately after the session and then another spike the day after. With subsequent sessions people generally notice improved energy levels, mental clarity, and an overall sense of well-being.